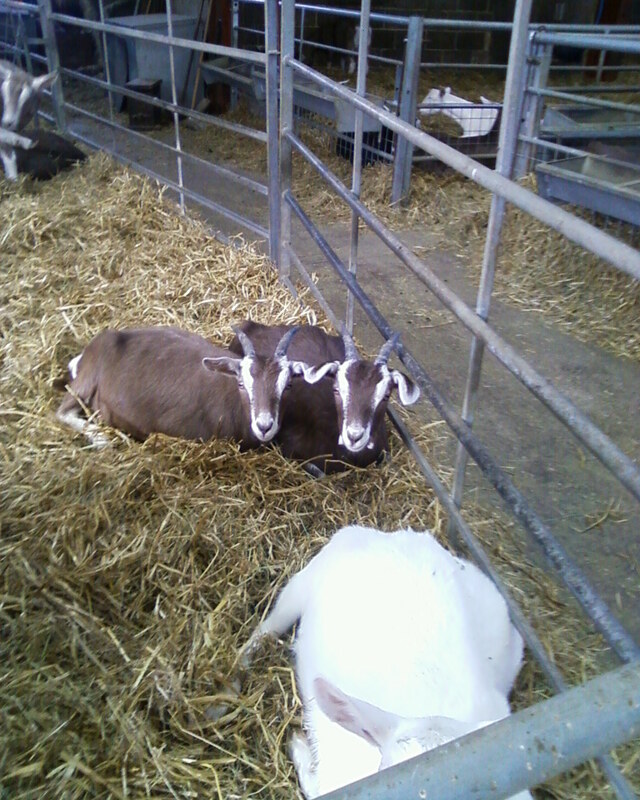 Today was one of those rare occasions when I managed to spend the majority of the day with the goats. Usually I am dashing off somewhere to make cheese or deliver milk but today I was allowed to stay in the goat shed for the whole day and it was great! Although it was a bit windier than previous days, the weather was still warm and sunny and the girls wandered out in the field for a short time. Quite a number of them were fluttering their eyelashes at the boys again - there are far too many hormones floating around at the moment! I have managed to get a few mated already but we will start in earnest tomorrow when my boy Daramac returns from his holiday in Margate. Mac lives with another pedigree milking herd for most of the year to keep their stud male company and returns to his home for a few months to 'work' with our girls. Part of my day was spent sorting out the fencing for his area so that he will have plenty of room to relax with his harem of lovely ladies. He will have over a dozen goatlings living with him permanently as well as the odd milker coming to visit from time to time. I always think that our male goats have a great life! I also managed to get a couple of photos of one of my little men with strange ears. When the two boys were born, their mum Pebbles was quite impatient for them to stand up and feed and she spent quite some time pulling them both up by their ears. We kept a close eye on her but eventually we had to separate them from her (just the other side of a fence) to let everyone calm down and have a rest for a few hours. She was able to see them and lick them through the fence but couldn't reach through far enough to pull at their ears. After a few hours, we put them back in with her and there was no further trouble. Both these boys should have ears that stick up but as you see, one of the little chaps suffered lasting damage and has the most wonderful little floppy ears.